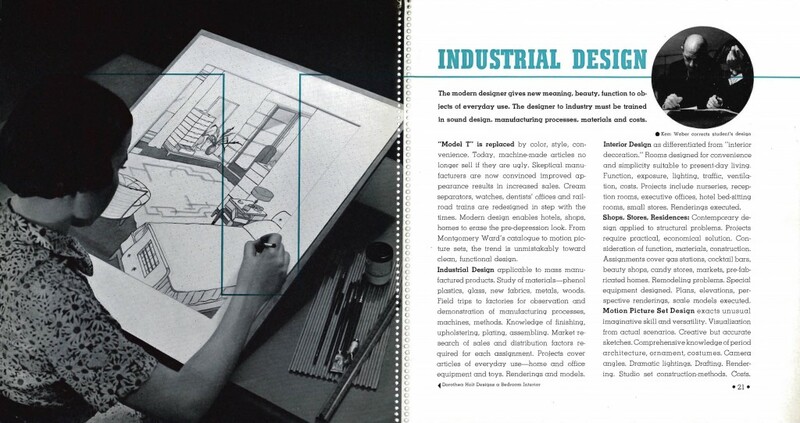 The Industrial Design program at Art Center began in 1932 with Kem Weber as the first director. During the first phase of this project we will be looking closely at our collection of photographs, documents, publications, and moving images from the 80 year history and digitizing a selection of materials. This page from the 1937 Art Center catalog offers a glimpse into the pedagogy of the department in its formative years. The Art Center Archives is very excited to begin our pilot project to select, digitize, and post online portions of our industrial design collections through generous funding from the National Endowment for the Humanities. Click here to read the announcement posting on Art Center’s Dotted Line blog.